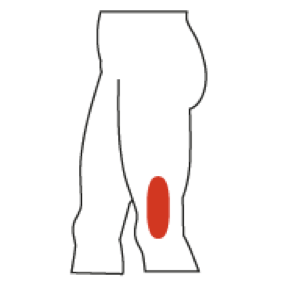 Patients that have equinis deformity and/or run up-hill are candidates for this disorder. 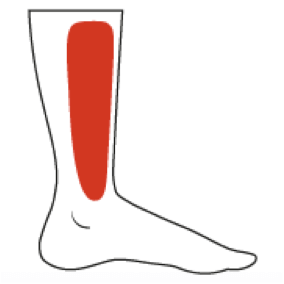 As the tibia moves over the foot, the ankle joint needs to be able to dorsiflex at least 10 degrees. If this is not possible, due to tightness of the aforementioned musculature, the tissues of the tendon can be damaged. 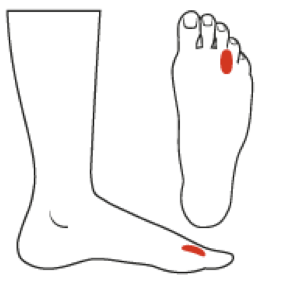 In addition, it is thought that over-pronation may reduce the blood supply to the area by “wringing out” the arterial blood supply to the tendon. This is due to the twisting movement of the tendon associated with over-pronation of the foot. prominence of the femur. It is therefore very common among runners especially if they run on a banked track or downhill. Being overweight: the more weight is brought to bear on the foot, the greater the pressure is on the forefoot when taking a step. As men and women age, the fat pad in the foot tends to thin out, creating less cushioning and making them more susceptible to pain in the ball of the foot. 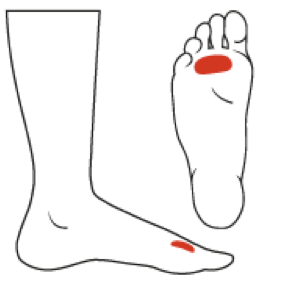 If the pain is anteromedial in location, the source of the problem may be over-pronation. The internal rotation of the tibia associated with over-pronation, may cause the knee to fall into a functional valgus orientation during the stance phase of gait. This in turn will compromise the ligaments on the medial aspect of the knee. Furthermore, the abnormal motion will result in abnormal pressures behind the patella, leading to a more specific knee malady referred to as chondromalacia patella. Quite frequently it is caused by an injury such as would be sustained by a fall on the buttocks or during a lifting activity. However, there is some evidence to suggest that a chronic irritation from abnormal foot mechanics is also a possible cause. When a foot over-pronates, it creates a tendency towards internal rotation of the lower limb. 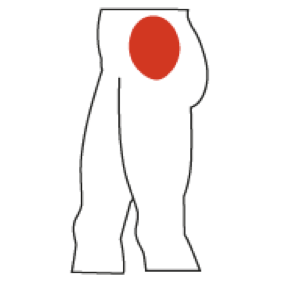 Due to the anatomy of the hip joint, this internal rotation translates into an extension of the pelvis (PSIS’s rotate upward while ASIS’s rotate downward). If the mechanics of the feet are not symmetrical, then conflicting rotations may occur at the two sacroiliac joints. 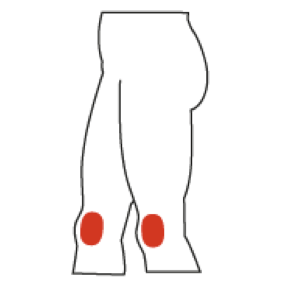 This appears to set up a chronic irritation of these joints leading to the inflammation. Both of these muscles are involved in slowing down pronation during the stance phase of gait. Tibialis anterior functions early in the stance while Tibialis posterior functions a little later. If the patient over-pronates or pronates too rapidly, either or both of these muscles may be called upon to work harder than normal. As a result, fatigue sets in, leading to inefficient force production which leads to micro-tearing of the soft tissue and therefore and inflammatory reaction. Since the muscle is wrapped in a fascial covering, the swelling that occurs from the aforementioned problem is restricted by this covering. Beyond the fact that much pain results from the entire process, the pressure within the fascial covering can be sufficient to “choke-off” the blood supply to the involved musculature, further added to the insult on the tissue. In severe circumstances the swelling can be severe enough to damage the deep peroneal nerve resulting in a permanent “foot drop,” as this nerve supplies the dorsiflexors of the foot. The scenario that typically brings on “shin splints” is a sedentary individual that suddenly starts running or walking long distances. When that individual is also an over-pronator, the combination of having weak muscles from lack of activity and having this biomechanical fault increase the likelihood of injury. Even changing the type of shoe worn during walking or running can be sufficient to increase the pronation of the subtalar and transverse tarsal joints and lead to tissue injury.